Little Bao at 72 Courtyard is Bangkok’s hot table of the moment serving up the Hong Kong-headquartered eaterie’s signature Chinese comfort food in a quirky retro Chinese-style diner located on the ground floor of Thonglor’s dining complex. The cosy interiors sport a distinctive Hong Kong 80s pop vibe with a fresh palette of two-tone teal hand-glazed ceramic tiles and pink mosaics (a nod to Hong Kong’s similarly toned pencil towers), red cherry timber tables and seating, and white and grey terrazzo floors, offset with burnt orange accents. 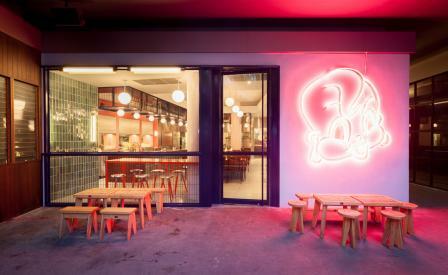 The 1,250 sq ft space features a navy-blue powder coated steel and wire mesh façade that evokes Hong Kong’s popular street-side hawker stalls, and is decorated with the brand’s neon baby face logo. For Acuna, the most important thing is that guests are comfortable and for that purpose all the furniture, including his signature low bar height proportions and booth seating, are custom designed. We suggest chef May Chow’s playful crispy Sichuan chicken bao burger washed down with a Snake Master cocktail combining snake wine, Aylesbury vodka, agave syrup, lime and B360.